People on several Caribbean islands are assessing the devastation wrought by Hurricane Irma, as residents wait for aid and tourists wait to be flown home. With ports mended and weather cleared, Caribbean officials struggled to get aid to islands devastated by Hurricane Irma on Monday and tried to take full stock of the damage caused by the Category 5 storm. 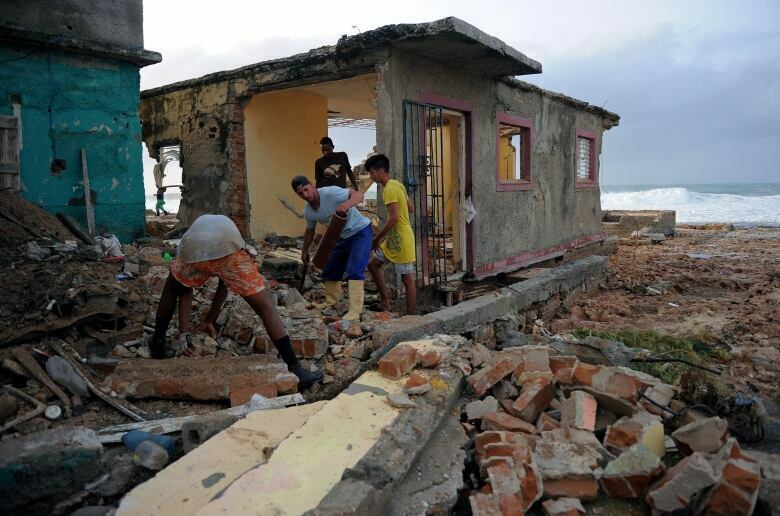 At least 34 people were reportedly killed across the region, including 10 in Cuba, whose northern coast was raked by the storm. Cuban state news media said most of those died in Havana, where Irma pushed seawater deep into residential neighbourhoods. To the east, in the Leeward Islands, which are popular tourist destinations, many criticized governments for failing to respond quickly to the hurricane, which flattened many towns and stripped the lush green hills to a brown stubble. British Foreign Secretary Boris Johnson defended his government's response to what he called an "unprecedented catastrophe" and promised to increase funding for the relief effort. Britain has sent a navy ship and almost 500 troops to help people on the British Virgin Islands, Anguilla and the Turks and Caicos islands that were pummelled by the hurricane. WestJet Airlines said Monday it was sending a plane to collect some of the Canadians stranded in Saint Martin by the disaster. The U.S. government said it was sending a flight to the island Monday as well to evacuate its citizens. Evacuees were warned to expect long lines and no running water at the airport. Saint Martin is controlled by the French on one side and the Dutch on the other side. An Air Canada charter flight was scheduled to bring 95 Canadians back from Turks and Caicos on Monday. A Royal Caribbean Cruise Line ship was expected to dock on Saint Martin to help in the aftermath, and a boat was bringing a large crane capable of unloading shipping containers filled with aid. A French military ship was scheduled to arrive Tuesday with materials to build temporary housing. 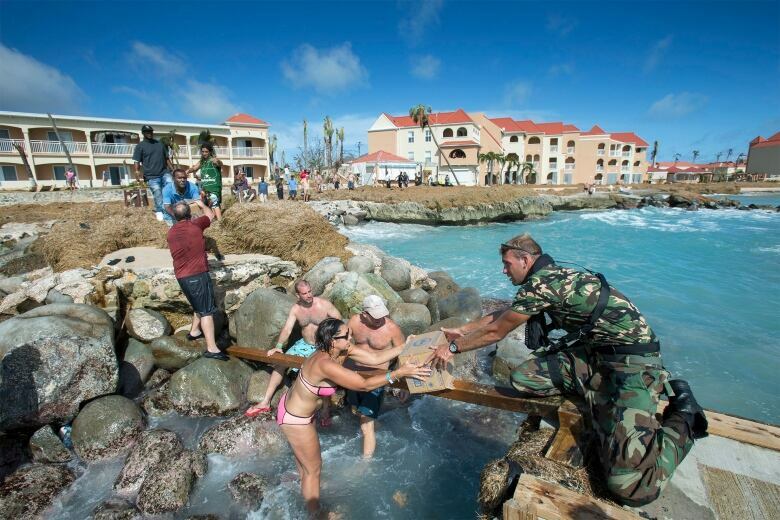 This photo provided by the Dutch Defence Ministry shows a human chain of residents passing supplies provided by a Dutch soldier after Hurricane Irma roared through St. Maarten (the Dutch side of Saint Martin). Some 70 per cent of the beds at the main hospital in the French portion of the island were severely damaged, and more than 100 people in need of urgent medical care have been evacuated. Eight of the territory's 11 pharmacies were destroyed, and Guadeloupe was sending medication. On Tuesday, French President Emmanuel Macron was scheduled to arrive in Saint Martin to bring aid and fend off criticism that he didn't do enough to respond to the storm's wrath. Interior Minister Gerard Collomb said the "whole government is mobilized" to help end the pillaging that hit the island in the immediate aftermath of the storm. Macron promised to go to the region as soon as weather conditions allowed. Soon after Irma left 10 dead on the island, Category 4 Hurricane Jose threatened the area, halting evacuations for hours before heading out to sea and causing little additional damage. 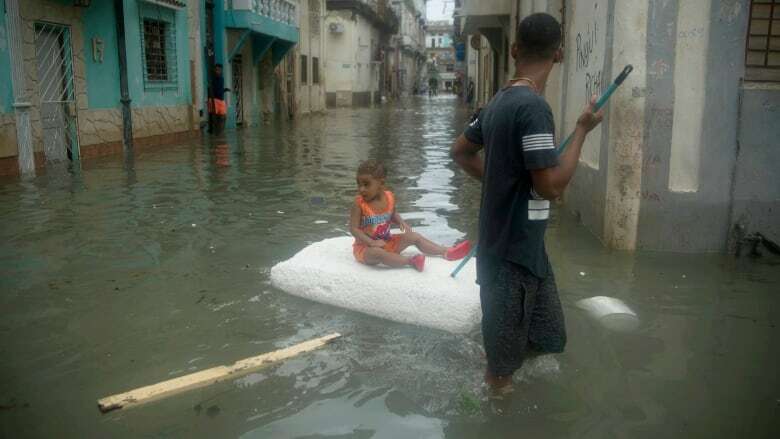 Cuba was also hard hit by the hurricane, where central Havana neighbourhoods along the coast between the Almendares River and the harbour suffered the brunt of the flooding. Seawater penetrated as much as a half-kilometre inland in places. Cuban state news media on Monday reported 10 deaths despite the country's famed prowess at disaster preparations. More than one million people were evacuated from flood-prone areas. Residents of Cuba's historic capital Havana were waist-deep in floodwaters after Hurricane Irma swept by, cutting off power and forcing the evacuation of more than a million people. Hector Pulpito recounted a harrowing night at his job as night custodian of a parking lot that flooded five blocks from the sea in Havana's Vedado neighbourhood. The Communist Party newspaper Granma reported that the Jardines del Rey airport serving the northern Cuban keys was destroyed and posted photos to Twitter showing the shattered terminal hall littered with debris.